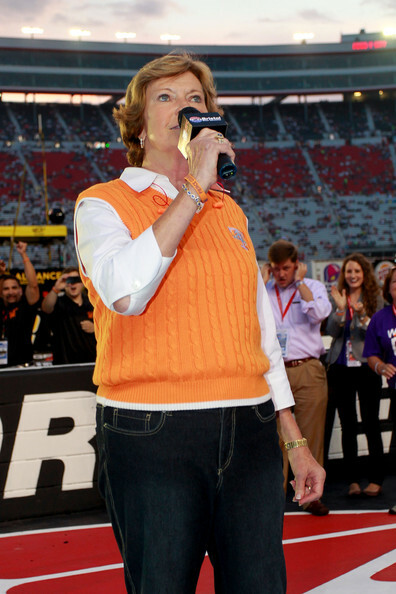 It was great to see that Pat Summitt gave the pre-race invocation at the NASCAR/Nationwide Food City 250 at Bristol Motor Speedway this past weekend. College basketball's all-time win leader (1,098) stepped down this season after 38 years coaching the Lady Vols. At age 60, she's been diagnosed with early-onset Alzheimer's. So for the first time in decades she doesn't have her thumbprint all over Tennessee basketball. Now she promotes awareness and education of early onset dementia and Alzheimer's through The Pat Summitt Foundation. The supporting slogan is "We Back Pat." And for the Nationwide Series race, 2011 Daytona winner and Knoxville native Trevor Bayne rocked the orange "We Back Pat" ride. Bayne finished 16th and the race was won by Joey Logano. While Summitt has struggles with her memory, it reinforces us to value our own. And one of the greatest memories in my career in television directly involves Pat Summitt. It wasn't the 1997 or 1998 Tennessee NCAA Championships that I covered, or the hospitality we always received on each trip to Thompson-Boling Arena. In 1999, Pat Summitt was the analyst for ESPN's WNBA coverage. That year we had our final broadcast on August 24th (I had to look that part up). As it was our last show, our "wrap" for the season, we had the wrap party in my Houston hotel room. Nothing special - a couple of cases of Coors Light on ice in the tub. The moment still gives me chills - Pat Summitt reaching into my bathtub with both hands, pulling out a couple of silver bullets and shouting, "Anyone need one?"